This image of Mt. McKinley at Denali National Park has nothing to do with Vincent Starrett or his book. It's just pretty. To celebrate our 35th wedding anniversary, Joan and I took a trip to Alaska. We have talked about it for years, and I have to say it was one of the most memorable trips we’ve taken together. To wind up the vacation, we spent a few days in Vancouver, British Columbia. We loved that beautiful, energetic city and spent hours walking its broad streets. At the recommendation of a fellow Sherlockian (Thank you, Charles Prepolec!) I dropped into MacLeod’s Books one afternoon while Joan wandered the eclectic Gastown District. The card for MacLeaod's Books in Vancouver. Should you ever find yourself in that delightful city, you should visit Mr. Stewart. Proprietor Don Stewart had a crazy cascading mountain range of books that echoes the mountains which surround the city. Some aisles are almost unnavigable and more than one person at a time is a crowd in several spots. After a few hours of pleasant but fruitless hunting for Starrett volumes, I asked if he had anything that was not obvious. Stewart thought for a moment. “There’s something here. . . . “ he said with little certainty in his voice. He hunted for a bit, went to an adjoining property to search its basement, and came back empty handed. He gave me his card and suggested I drop him an email. I thanked him for his time, feeling bad that I couldn’t reward his efforts with a Starettian purchase, and headed out to wander Gastown. Or so I thought. I was on my way out of the shop when he hustled up behind me, a badly scuffed brown volume in his hand. The back cover was even worse and there was a nick out of the spine at the top. Nonetheless, it was easy to identify it as a copy of Banners in the Dawn, Starrett’s first book of poetry. This actually presented a problem: I already own three copies of Banners (don’t ask me how, I didn’t plan it), including the one inscribed to Fridolf Johnson, the subject of a recent article here. I told Mr. Stewart this, and he grinned. “But do you have one inscribed by Starrett to his mother?” he asked. Mr. Stewart held out the book and gently opened it. Sure enough, the FEP held the following inscription. The rare inscription from Vincent Starrett to his mother. Note that in his family, he was known as Charles or Charlie, while most of his professional acquaintances called him Vincent. My vision cleared. Mr. Stewart was still smiling. We discussed price; I paid and left. I don’t recall much else about the Gastown District, (the vague hooting of the town's steam clock was there somewhere), but I do recall feeling the trip to Vancouver — if not the whole vacation — had been more than worthwhile. Gassy Jack, whose nickname prompted the naming of the Gastown District. Before I left his shop, Mr. Stewart said that I now had a little mystery of my own. “How did this book get from Chicago to Vancouver?” he asked as I left his shop. I have been doing some research and am pleased to say I have a little theory. At the same time, the story of how the book got from Chicago to Vancouver is a sad tale indeed. But first, we need to have a few words about Starrett’s mother: Margaret Deniston Young, wife of Robert Polk Starrett and daughter of Toronto bookseller John Young. Starrett lovingly speaks of her in several spots of his memoir, Born in a Bookshop. Here are few excerpts. A crisis in the affairs of a nation always brings forth men who rise to meet the occasion. There are in every land men who are so filled with love of country that they are willing to sacrifice even life itself to serve the country’s best interests. The dust jacket to Starrett's memoirs, Born in a Bookshop. Even at an early age Starrett had a passion for detective stories and devoured the dime novels of the day in his home “while Mother read her Bible and Dad rustled the pages of his newspaper. After a time, it is true, Mother became suspicious of them—their very appearance was sinful—and spoke about them to my father.” Starrett’s father agreed to check them out, only to became just as addicted as was his son. Starrett’s mother was a dominant force in their local church. And it’s here that we find a possible solution to how this volume of her son’s poetry came to be battered and in a Vancouver bookshop. Karen Murdock, in Sherlock Alive, adds a more somber note: "October 3, (1933), death of Vincent Starrett's mother, who went overboard from a ferryboat in Vancouver, British Columbia, a probable suicide. Her body was not recovered until over a year later." 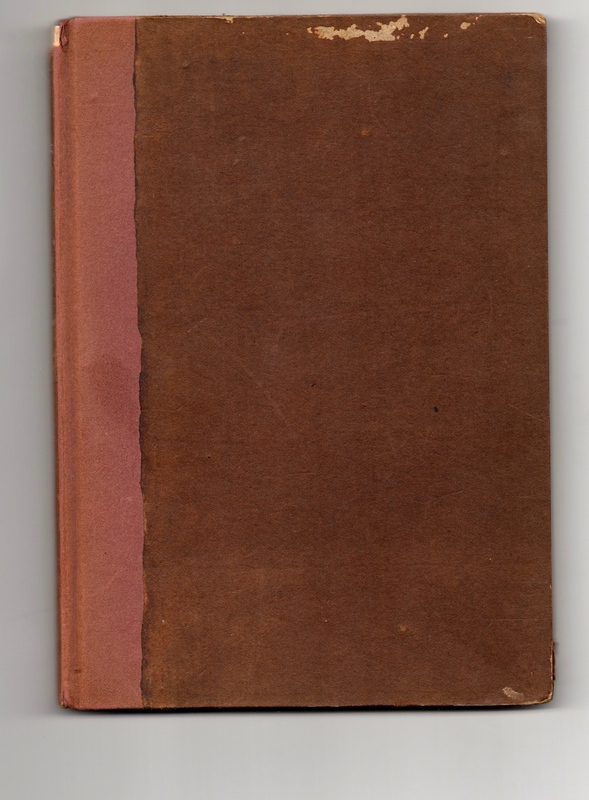 Is it too much to suggest that on her last missionary trip to Vancouver, Mrs. Margaret Starrett had taken with her a treasured volume of her son’s poetry as a reminder of her Chicago home? And then (after some adventures of its own) the little volume wound up almost 80 years later in Gastown and at MacLeod’s Books, where we met? Until a better suggestion presents itself, I say the mystery is solved, Mr. Stewart. Starrett's elegy to his father. Of the poems in Banners in the Dawn, i can find no obvious reference to Starrett's mother. His father is a different case altogether. "November 24, 1918" is a tender farewell to man who was supposed to stop Charlie from reading dime mysteries, but became a fan of the disreputable form himself. I saw my body sink to dreamless sleep. Who but a moment since had breathed and sighed. With the gray smile of one who has just died. And the white nurse's fingers in my hair. Thus died my father, brave and strong and true. Loving life much, and laughter more than tears . . .
His deep, fine laugh out of the utmost blue . . . It was my father's son that gasped and died. *NOTE: In his memoir, Starrett sets his mother's death in 1935. In fact, she died in 1933, as Karen Murdock correctly reports. An earlier version of this article had only the 1935 date. Thanks to Fran Martin of Vancouver, B.C. for pointing this out.